Goerlich Quadruplets: Happy New Year! 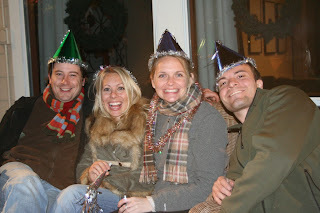 We rang in 2009 with our dear friends, Jennifer, Jason and Ansley here at our home. 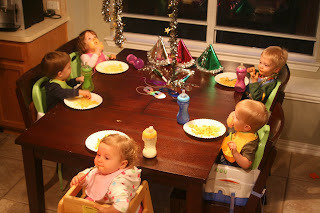 We started the night off with a yummy meal of mac-n-cheese. Sophia and Noah were intrigued with the show! ...and on. We finished the night on the back deck by the fire. Wishing everyone a happy and healthy 2009. We cherish each of your friendships and the support you give to us throughout the year. Love to all of you! 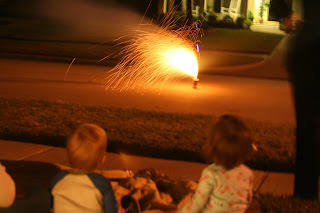 The best kind of celebration-fun and safe at home! Happy New Year to all of you-God's richest blessings be yours. Much love. 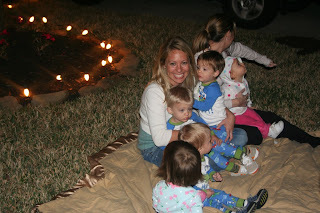 What a great way to ring in the New Year....surrounded by close friends and your darling little elves. Happy New Year Goerlich family! LOVE the pics! 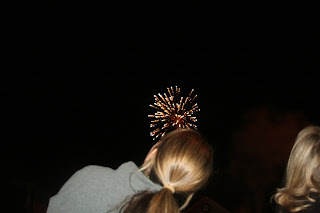 Ours loved their Daddy's fireworks too! I was just SO happy they did not cry and just watched in amazement! Thanks for having us, we had such a fun night!!!!! Love You guys!!! !